At this time of the year, we see a lot of our good friends, conifers. A conifer is a tree that bears cones and evergreen needlelike or scalelike leaves. Although these trees are common and familiar to most of us, there is much more to conifers than what meets the eye. As Pachamama Alliance's holiday gift to you, we'll share 8 things you likely didn't know about conifers! The Norway Spruce is a traditional Christmas tree in Europe that lives about 600 years and it's only about 13 feet tall. But, this particular tree is connected to a root system that has existed for 9,550 years! When a Norway Spruce dies, the root system places a fresh seedling where the tree was. This new tree seamlessly takes the old trees place - sprouting up again like a phoenix from ashes. It should also be noted that Bristlecone pine trees can live an uninterrupted 4,800 years. Conifers cover much of the northern hemisphere specifically in the taiga biome, and are found in forests all over the world. The vast conifer forests of the world also represent the world's largest terrestrial carbon sink, accounting for the most carbon absorbed from the atmosphere and stored on land. For many centuries, the Church strongly opposed the usage of Christmas trees for holiday celebration. The decorations of homes with a pine tree trees did not catch on with the general populace until the mid eighteen hundreds - the tradition brought to the United States over a century prior by German immigrants. "Thus saith the LORD, Learn not the way of the heathen, and be not dismayed at the signs of heaven; for the heathen are dismayed at them. For the customs of the people are vain: for one cutteth a tree out of the forest, the work of the hands of the workman, with the axe. They deck it with silver and with gold; they fasten it with nails and with hammers, that it move not." 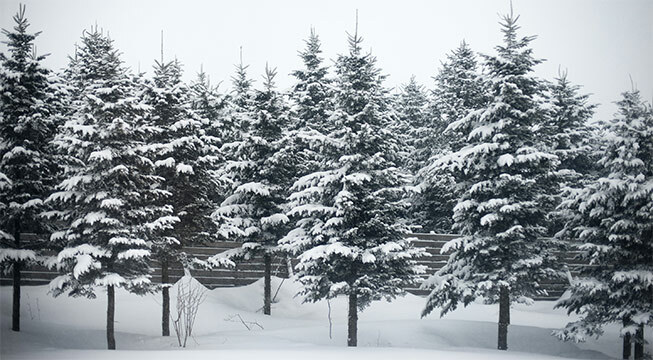 Conifers grow in 6 of the 7 continents on Earth. That only excludes Antarctica! Not only is a type of conifer the oldest living tree on Earth, but the conifer family also holds the honor of playing host to the world's tallest tree! This towering tree is located in the Redwood National Forest in Humboldt County, in California. And this special tree has a special name - Hyperion. Hyperion is a redwood sequoia, standing at an astonishing 379.1 feet, thus clenching the honor of being the tallest living tree in the world! Conifers produce both female and male cones. Male cones shed pollen and female cones make seeds. Wind blows pollen into the female cones, pollinating the seeds. Pine nuts are edible pine seeds. Small pine nuts posses a wing that allows them to easily sail and glide through the wind when they are dispersed. The large oily pine nuts that people routinely eat are from the Pinyon Pine tree. Certain conifers, including lodgepole, Monterey, Pond, knobcone, and bishop have fire cones. Fire cones are encased in wax. In the event of a fire, fire cones drop to the ground. The heat produced by the flames melts the wax, causing the cone to open up and release its seeds. This process takes several weeks. Ultimately, it results in a scorched area being gradually repopulated, as the seas begin to sprout, bringing forth new life. The holiday seasons are a time to show appreciation for those we love. And, as an extension of this wonderful sentiment, it can be a time to show appreciation for all the beautiful living things in this world, including conifers! There is so much that we can learn from the plants we share this planet with. For thousands of years, the indigenous people of the world have looked to plants for guidance and used them as medicine. Download our e-guide, "Sacred Plants, A Gift from the Gods" to learn more about how the indigenous people of the Amazon use plants to connect with the spirit world, and the Earth itself.